Restorative nursing care is that "little extra help" for those who don't necessarily need rehab, but still need additional assistance to continue improving or to maintain their current level of independence. 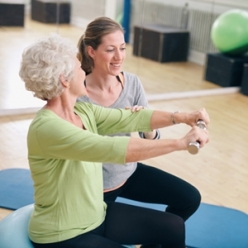 From exercises to increase or maintain strength and mobility to assistance with dining, patients receive the encouragement, cues, and support they need. Long-term care is when a person requires assistance with his or her physical or emotional needs over an extended period of time. The need might be due to a terminal condition, disability, illness, injury or the challenges of old age. Our outstanding staff provides the highest quality care and constantly demonstrates compassion for each of our guests in long term care, skilled nursing, hospice, short term rehab, and outpatient physical therapy. 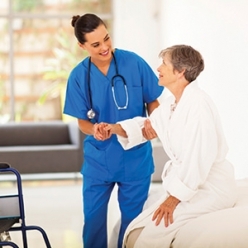 We are one of the leading-edge, long-term care facilities in New York State. Since 1830, Wayne County Nursing Home has provided excellent care to residents. Today, we work together to help you feel at home. Services include exceptional long term care, skilled nursing, short term rehab, respite services, hospice and palliative care. In addition, specialty services include stroke recovery care, memory care, bariatric care, wound care and VitalStim. Our highly trained, dedicated professionals deliver care that allows our patients to achieve their highest level of independence. We are conveniently located 15 minutes away from Lyons, Clyde and Newark NY. Our new facility is bright and spacious. With 192 beds, we are proud to be the largest skilled long-term care facility in Wayne County and Ontario County. Schedule a tour to learn more about the range of services available at Wayne County Nursing Home & Rehab Center. Our Short-Term Rehabilitation programs are focused on helping our patients return home as quickly as possible following hospitalization or illness. Physical, Occupational and Speech Therapies are provided 6-7 days per week in a state-of-the-art rehabilitation gym, supported by our caring nursing and medical professionals. Our goal is help residents achieve their highest level of functional mobility, activity, and communication and ultimately send them home. Our rehab treatment plans are specifically designed to meet the specific needs of each individual and their unique family circumstances. We're Hiring. Please Call If You're Interested. Merry Christmas to all our friends and families! It's Throwback Thursday and here a look at the 2008 Festival of Trees.